Remember those big jugs of soap we used to lug home from the store? The bottles were heavy and hard to pour out the exact quantity of liquid to add to the washing machine. It would leak down the side after we put the cap back on, then the design changed. Bottles became more compact, drip free, made out of recycled material, and are recyclable. The formula is concentrated, meaning less water in the bottle and not as heavy to carry and use. But wait, it gets even better for those of us that attend to the wash! Next month you will be able to purchase a new kind of laundry detergent. Purex® UltraPacks™ will be available in stores. 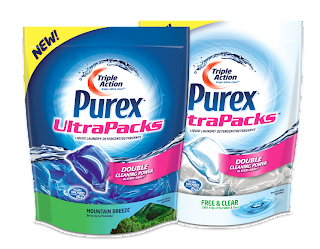 Purex® UltraPacks™ are Triple Action liquid detergent formula in a pre-dosed pack. No need to measure, no heavy bottle, no spill, leaks, or drips. Take one out of the bag and toss it into the washing machine. Done. It's easy to put in my shopping cart, not heavy, not bulky. Less waste. pre-measured packs. no spills, leaks, or messy hands. Convenient packs to add to the washing machine, even using one hand. Cleans the laundry in hot, warm, or cold water. It works! Nice fragrance, and clean clothes. Available in Mountain Breeze® and Free & Clear formulas. You can recycle the plastic bag the packs are in. 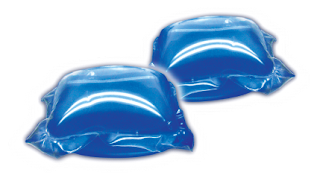 Each Purex® UltraPacks™ contains 2X concentrated liquid detergent-double the cleaning power in every drop-as compared to traditional liquid detergent. The packs dissolve quickly once they are added to the washer as it is filling with water. Good to use in hot, warm or cold wash. You can use the packs in all machines, including high-efficiency machines. For front loading machines, put the pack in the drum not the drawer. One pack, one load. For larger loads or really dirty duds you can use an additional pack. My tip for using the packs, and this is from my own experience, which I need to remember-is this , make sure your hands are DRY when you take a pack out of the bag. If you handle the packs with wet hands they will start to dissolve and even in the bag they get stuck together. I do this all the time with dishwasher packs. I usually set the dishwasher timer for after bedtime, but when I load it, it's after I have washed the sink dishes, and don't dry my hands. So be sure to have clean, dry hands when you handle Purex® Ultra Packs. CLOSED,Giveaway: Leave a comment on this post by January 29, 2012 at midnight EST for your chance to win a coupon sent to you for a FREE pack of Purex ® UltraPacks™ of your very own. Winner will be chosen by random.org. Congratulations to comment #5 you are the random winner of the giveaway! thank you for everyone's comments. Free Sample: visit FreeSamplePurex.com in February 2012 to request your own free sample of Purex® UltraPacks™. Disclosure: Purex provided a free sample of their UltraPacks laundry detergent. The comment and views are my own. Would love to win these and give them a try :0) Thanks for the chance!! Congratulations to Tara1965 you are the radom chosen winner for the Ultra packs! I have been wanting to try these! Love your review! Hoping I win! Thanks for the opportunity! BTW - as always - I just love your blog! I would love to win this, it would make doing laundry so much easier. Cheryl Free, I am so sorry I did not receive your comment. 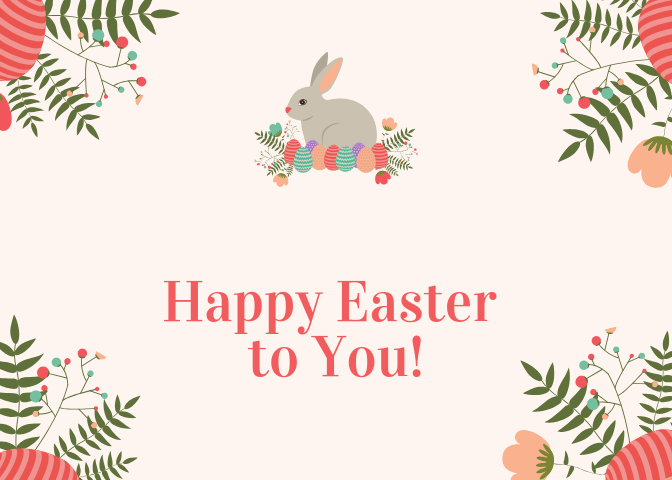 I would have been most happy to publish your comment to have it in the random drawing.Thank you for letting me know your comment was not published. I do apologize for not receiving the comment to publish it.